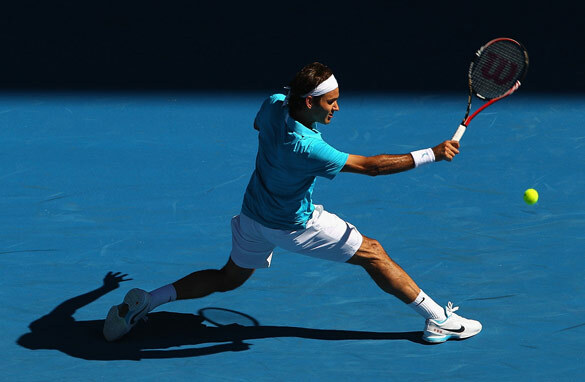 Will 2010 be a tennis year to remember? I know it’s a bit late for 2010 sporting predictions but watching the Australian Open has prompted a revelation. Roger Federer has ruled the courts, now though more players are catching up and a shift of power may be taking place. Instead of hankering for a mythical golden age when [John] McEnroe, [Boris] Becker, [Stefan] Edberg and [Jimmy] Connors strode the court, my rose tinted spectacles have been lifted. I have gazed into the future and am licking my lips at the prospect of a mouth-watering year of tennis action. In many ways, sports fans have already been spoilt for choice over the last decade and a half. Take a look at CNN’s Decade Dominators on these very web pages and there have been some glittering performers to admire. But every Tiger Woods, Michael Schumacher and Lance Armstrong needs a strong rival before the sporting sparks are really able to fly – and that’s why I think tennis is shaping up for a fascinating 12 months. After Roger Federer replaced Pete Sampras as the major power in the men’s game, he looked untouchable for a while. Then, before we could get fed up with "The Fed", along came Rafael Nadal to show us how tennis titles could be racked up in a very different but no less thrilling way. They will both finish their careers as legends of the sport and, putting aside the concerns about Nadal’s knee for a moment, we should enjoy their Swiss-Spanish rivalry for some time. What makes it even more exciting is the throng of potential greats who are lining up to challenge them. Serbia’s Novak Djokovic, Britain’s Andy Murray and Argentina’s Juan Martin Del Potro are the next highest ranked players and it would take a brave person to bet against any of them building tennis CV's to compare with the very best. And what a fantastic mix of styles and approaches – Federer, graceful and balanced, Nadal, the "muscley Madrista" with a flashing forehand, Djokovic, the locker room joker who can also produce smiles on the court with his crisp ground strokes, Murray’s guile and athleticism and Del Potro’s colossal court presence are an intriguing mix. And if you add Andy Roddick, Nikolay Davydenko, Marin Cilic and Jo-Wilfried Tsonga the men’s game suddenly looks as competitive as it has been for many years – maybe since the 1980s or early 1990s. Although the women’s game is suffering by comparison, it too can look forward to a fascinating 2010. The return of Belgian duo Justine Henin and Kim Clijsters has made everyone sit up and take notice. Serena Williams appears to be taking her tennis as seriously as at any stage of her career and her rise to number one may yet provoke a response from Dinara Safina, mocked for her uncomfortable reign at the top of the rankings for much of 2009. If youngsters Caroline Wozniacki, Victoria Azarenka and Agnieska Radwanska keep improving and Maria Sharapova and Ana Ivanovic rediscover their Grand-Slam winning ways, the women could yet match the men for unparalleled rivalry. I agree with you but I don't see women's tennis coming anywhere near men's(no offense). Last year Safina was world no. 1 for a long period of time without winning any Grand Slam and S. Williams was no 2 even after winning most of the Grand Slam. In men's tennis, there has never been a world no. 1 who has not won a Grand Slam. I believe Federer is going to stay at no. 1 but Rafa will improve and French Open and Wimbledon is going to be exciting. As of Aussie Open, it's Federer's to lose. Also, I don't see Andy Murray winning any Grand Slam again this year even though he beat Nadal. Certainly a good article and yes, this year certainly looks like being a super year for tennis, both mens and women. But Alex you forgot to mention the Chinese factor – they are without doubt going to make their presence felt in the womens circuit. WTA tour doesn't have the same quality as the ATP tour. I can not imagine Nadal or Federer reaching the final round of a grand slam after taking a 8 months break. Two men have been world # 1 without wining a grand slam Ivan Lendl (Feb. 28, 1983 – First grand slam French Open 1984) and Marcelo Rios (never won a Grand Slam). No matter how many players there are out there gunning for the No 1 spot, Federer is the man to beat. Until his departure, he will continue to make his presence felt for he has changed the game forever. No men's tennis player has ever achieved what he has and done in it such style.